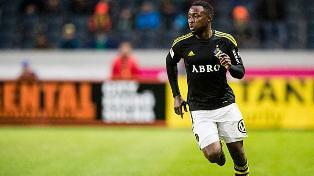 Chinedu Obasi ended his goalscoring run in AIK Stockholm’s 1-0 loss to IFK Göteborg in the Swedish Alllsvenskan on Monday night. Heading into the fixture at Gamla Ullevi, the Nigeria national-teamer had found the back of the net in four games on the trot, which saw him tie a record first set by ex-Malmo striker Edward Ofere during the 2009 season. Obasi came close to grabbing an equalizer in the second half when his shot from the left was saved by IFK Gothenburg netminder John Alvbaage. Seven years ago, former Super Eagles striker Ofere had scored in four league games against Djurgardens IF, IF Elfsborg, Gefle IF and Hammarby IF before he ended his run against IFK Göteborg on October 19, 2009. Three rounds left before the end of the 2016 season, AIK missed the opportunity to close gap on leaders Malmo following the defeat today.